Disclosure: I received the Lyric for review from Epiphanie Bags. All opinions are my own. I love taking photos of my kids and while I prefer the quality of my DSLR to my phone, I don't carry it around much because of fear that something will happen to it since I usually just put it in the car or stroller. I also don't carry around my extra lens which is a shame. Epiphanie offers fun and stylish camera bags to tote around your camera and gear. Since I am partial to crossbody bags at the moment, the Lyric is perfect in size (13"L x 4"W x 15"H) and weight (2.5 lbs). The chocolaty brown Lyric bag ($154.99) has an amazing capacity inside. 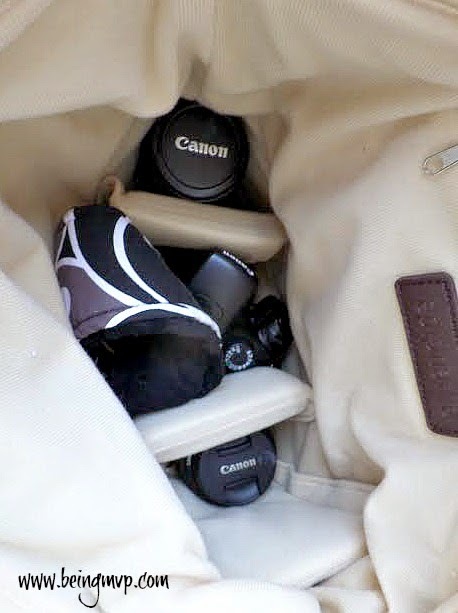 I can fit my camera plus the attached lens, a spare Canon EF 50 mm f/1.4 lens, my wallet, phone, lip balm, memory card, key. There still remains room to allow for another lens. I have my eye on the Canon EF 50 mm f/1.8 lens as well as a long lens. The padding is excellent and I am confident that my camera and lenses will be protected from any potential drops. 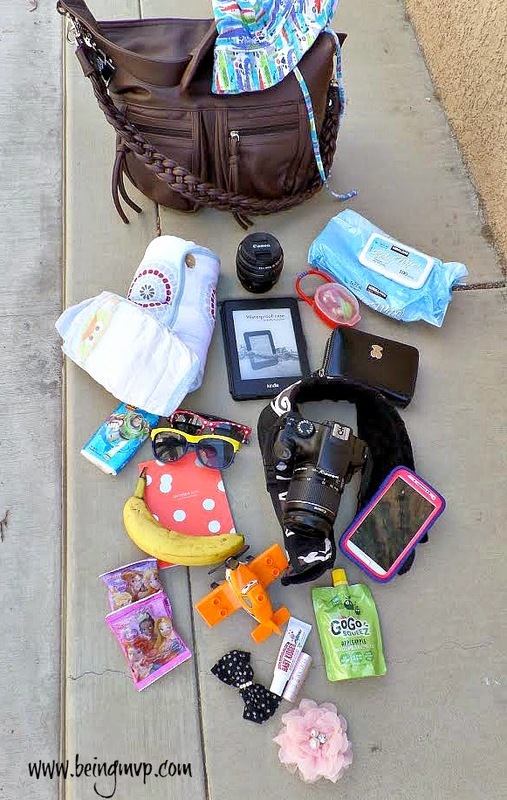 I easily also have room to stash a couple of diapers and wipes for true on the go with my kids. There is also a back pocket that can hold my kindle or iPad. I am also going to get the Macbook Air soon which would fit perfectly as well. What's fantastic about this fashionable camera bag is that you can remove all the dividers to use it as an everyday bag. It's great when you have little ones because the water-resistant, high-quality synthetic leather is easily wiped down with a guess what? - baby wipe! 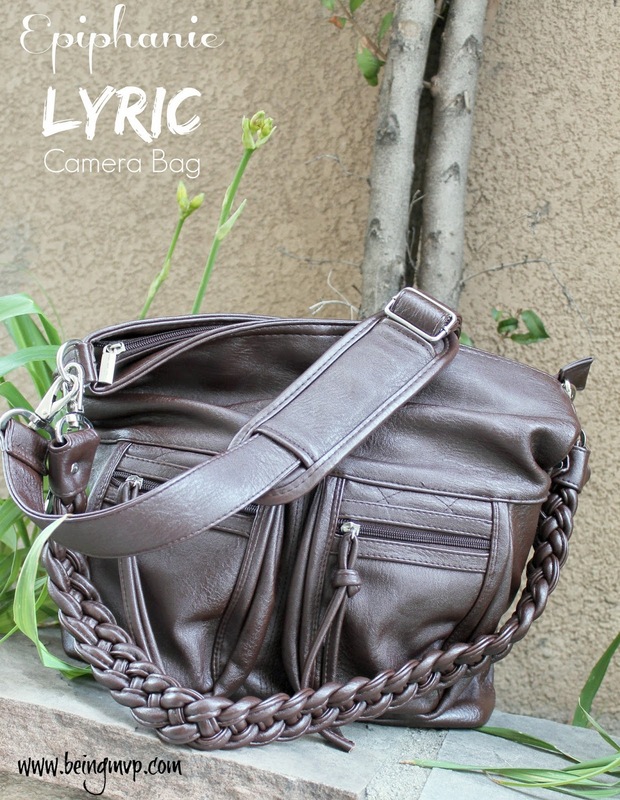 While I love wearing my Lyric as a cross-body, (the 51" max length padded strap is detachable) I can also carry it like a tote with the braided shoulder strap. How chic am I looking like a pro chasing after the kiddos for capturing must have moments? Make sure to connect with Epiphanie Bags on Facebook, Twitter, Instagram and Pinterest! WIN IT! Epiphanie Bags is offering choice of bag (in stock) for the Hello Summer Giveaway Hop. Make sure to come back on May 13th when the event begins! I love their bags!!! Coveting a Stella for so long. This bag is wonderful, I love the concept. I'm sure I would prefer to wear mine cross-body as well, for me --to free my hands, and I think it's better on the back. I have been wanting the MADISON in Turquoise for such a long time. Very pretty bags and very roomy! I love how stylish these are, and they protect the camera, great combination. I can't even count how many times I've thrown the camera in my purse, without a case, unprotected. My husband hates when I do that, but it's too much to carry my purse and the camera bag. I bring my camera almost everywhere. These bags are so cute and spacious! I wouldn't even think it's a camera bag. Looks more like a purse to me! Would love to have the brooklyn backpack! These are really nice bags. I need a camera to go with it! These handbags that are camera bags are gorgeous. Epiphanie has a lot of different styles and colors to choose from and I like so many of them. I own the Epiphanie bag in the slate color and I love how comfortable it is on my shoulder. It's a nice and roomy bag! I love how classic these bags are, and how many different colors and styes are available. The London backpack is my favorite, because both my husband and I could use it! (Sponsor Spotlight | Epiphanie Bags) They have some of the neatest looking camera bags on their site, I would like to have one someday. I would love the Brooklyn backpack in Caramel. One of the things I'm looking forward to this summer is finishing my graduate program. I like the Lyric bag in either black or olive. These bags sure hold a lot of items and I love how they are sectioned off inside to organize your items. What an awesome bag! I travel a lot and this eoul dbe perfect to lug all my camera and computer equipment on the plane. My favorite bag is the Austin Grey!